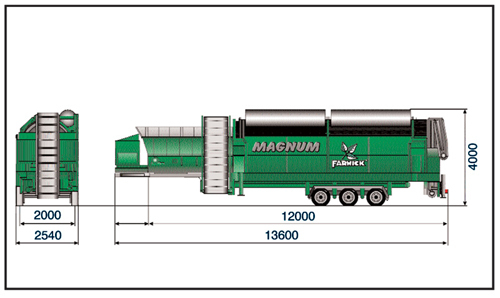 The MAGNUM is a mobile screening machine with the highest possible throughput, as it needed by contractors and operators of large composting facilities. Currently the largest European-built screening machine with throughput capacity of up to 200 m³/h with 48 m2 of effective screening surface. Fully mobile due to 3-axle semitrailer design with robust base frame as well as simple parking and stable standing due to 4 hydraulically actuated supports. Continuous and safe operation due to wide hopper, also for wheel loaders with a volume of 5 m³, as well as hopper overload protection and motor protection system. - special trommel with anti-soil bars for residual waste screening as an option, also available as 3-fraction screening machine: separation by smaller screen holes at the front and larger screen holes at the back. High operating convenience due to continuos rotary speed control of the trommel and the hopper belt with hydraulic straight-discharge control, as well as hydraulically foldable and extendable discharge belts.